Juvéderm® VOLUMA is an advanced, cohesive, 3D hyaluronic acid matrix dermal filler, manufactured by Allergan; the makers of Botox® / Vistabel® and Juvéderm ULTRA. It differs from the ULTRA product in that it is a much thicker hyaluronic acid gel, which has been produced by modifying the cross-linking technique by using low molecular weight hyaluronic acid in order to create a more viscous result, which can then be used for recontouring and restoring the face in the case of age-releated volume loss. Juvéderm® VOLUMA was launched in the UK in 2009. Juvéderm® VOLUMA contains non-animal hyaluronic acid in a highly viscous gel. The Juvéderm® VOLUMA product is available with or without the addition of lidocaine, to aid patient comfort, particularly in the case of a deeper injection site, or with the use of a cannula technique for placing the product. Trained Medically and Dentally Practitioners only. It is indicated for deep volume restoration to recontour the face, such as in the cheek bone and chin regions. To be injected deeply into the deep dermis, subcutaneous or upper periostea (just above the bone). The product is supplied to the practitioner with 23 gauge ultra thin wall needles and 18 gauge 70mm cannulae to allow for different depth injection and product placement. Also available with added lidocaine, local anaesthesia. Patients with severe allergies manifested by a history of anaphylaxis or history or presence of multiple severe allergies and those with a tendency to develop hypertrophic scars. Juvéderm® VOLUMA should not be administered directly after laser treatment, deep chemical peeling, dermabrasion or in the case of superficial chemical peeling if there is a severe inflammatory reaction, or in an area where a permanent implant has previously been injected. It should not be injected into the periorbital area, the area around the eye which includes the crow’s feet and tear trough regions, into the glabellar (frown lines) or into the lips. 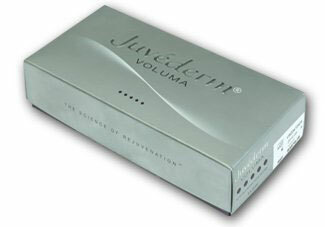 According to the manufacturer Juvéderm® VOLUMA creates an improvement for up to 18 months. Inflammatory reactions such as redness and swelling can appear after the injection which can be associated with itching or pain on pressure. These reactions can last for a week. Other possible rare side effects include nodule (lump) formations at the injection site, haematomas (collections of blood), discolouration or increased pigmentation at the injection site or a poor result in terms of the restoration effect. You should avoid massaging the injection site or putting pressure on it for a few days following treatment and should avoid extremes of temperature (e.g., sun exposure, saunas etc.) for up to 2 weeks. The cost depends on the area treated and how much is required, and the practitioner doing the treatment, but price ranges are in the region of £500 - £750 per treatment with Juvéderm® VOLUMA.